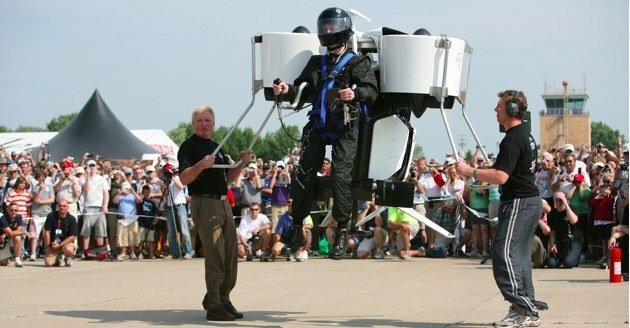 Inventor Glenn Martin crafted the personal propulsion pack, which he has test-flown over a thousand times — but only by hovering a few feet above the ground. This May in New Zealand, Martin (monitored by a fire rescue squad) sent the jetpack 3,500 feet into the air for nine minutes and 43 seconds. That test flight wasn't manned — a test dummy was along for the ride — but it was enough to demonstrate that Martin's jetpack could stay aloft safely for a prolonged period of time. The jetpack's most interesting feature is its support for a flight control unit — the same kind that steer the military's Predator drones and many other UAVs (unmanned aerial vehicles). With the remote control, the jetpack's utility reaches far beyond the scope of commercial use: military missions and search-and-rescue operations by medical teams could use the pack to extract a person in harm's way. Two things stand in the way of the unfettered freedom of jetpack travel. The first is the $100,000 price tag. That's about the cost of eight Smart Cars. The second obstacle is the FAA. While this latest jetpack is legal and does not require a pilot's license, it falls under the FAA's guidelines regulating ultralights. That means a maximum fuel capacity of five gallons and a top air speed of 55 knots (about 63 mph). Not exactly my idea of space age fun. Still, this would make an awesome Father's Day gift!